Real quick one today, basically a repost of a CustomerSource post today. 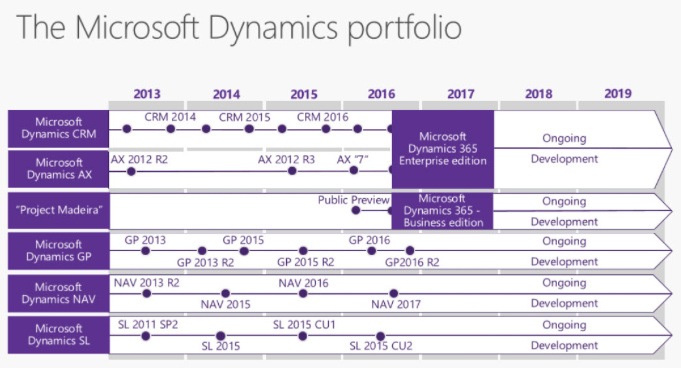 The new Dynamics 365 offerings are a bit…. shall we say…. confusing? Ambiguous? The Dynamics 365 page itself seems to have a large number of products on it, they call it all sorts of names, there seem to be a couple of different editions, for different markets. This post is a good attempt at creating some clarity around Dynamics 365. Microsoft wants to re-invent business processes. Personally I think that’s BS because the processes themselves won’t really change, it’s just that those processes will be executed by a set of online integrated products. Don’t get me wrong, the technology is moving at lightning speed, and the capabilities are mind-blowing. Microsoft calls it ‘digital transformation’. Now it is REALLY awesome to be able to have a conversation with a prospect, create a quote/order right from your email, have everything posted immediately in your financial system, and see sales figures in a dashboard in real time. The technology to make that happen is now becoming a reality, but the business process itself is really not that different. Clarity about the Dynamics Portfolio. Really important to understand the various products and how they connect and relate. Dynamics 365 Business/Enterprise are based on NAV/AX respectively, GP/SL will technically not have a cloud offering. The consequences for SL/GP partners is that they will have to learn NAV/AX to go into the cloud. Other Microsoft technologies, such as the common data model, PowerBI, Power Apps, Flow, Azure… These will all be offered in a way that allows you to integrate them in a seamless way. You can extract data for your PowerBI dashboard from any other Dynamics offering, and present the relationships in one look. You can use Flow and Power Apps to build your custom workflow, and use data from multiple systems in real time. VERY powerful stuff. Have a read in this article, there are a ton of links in there for you to follow down the rabbit hole.